Placerville provides a community that is conducive to business operations. Progressive local government and a wide range of established services offer a strong support system for business and industry. Innovative educational services and dynamic health care facilities provide for the needs of Placerville's residents. 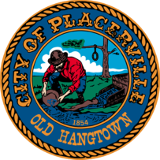 The City of Placerville operates its own planning department and administers their own zoning requirements. Placerville operates with a Council form of government. The region's principal air carrier facility. Traveling distance is 53.3 miles with an average driving time of 59 minutes. The City of Placerville covers a total area of 5.8 miles squared and none of it covered by water.